We try to visit England as often as we can and each time we do we select a different region or city. Hubby remembered visiting Bath once when he was a child. So, Bath it is! From the moment we arrived, I knew I was going to love England’s only World Heritage City. It might sound strange to describe a city this way, but, for me, it had gravitas. We chose a small, older hotel, centrally located, directly across the street from the train station. It couldn’t be more perfect. Bath is a ‘walking city’ and we were able to do just that … with quick stops back to the room to refresh and relax for a moment before eagerly conquering our next destination. Before our visit, I had no idea the reason the city is called “Bath” is simply because of the natural mineral springs around which the Romans built not only a massive temple but an entire city, over 2000 years ago. This magnificent structure rivals anything I had seen in Italy. It took over 4 centuries to complete this work of art. After falling into disrepair over the years, thankfully, it has been meticulously restored by the generous donations of countless organizations. 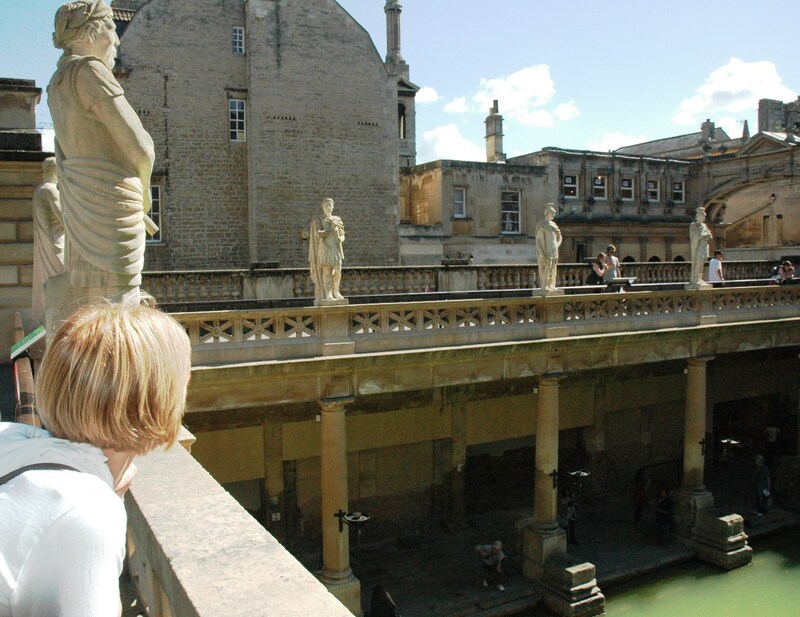 There are four main areas that comprise the Great Bath: the Sacred Spring, the Temple, the Bath House and the Museum. From the moment you descend the steps into the Great Bath, you start to imagine yourself part of the privileged class who would have indulged in the ritualistic bathing that was so important to the Romans. With your attendant in tow, you would pay your entrance fee, leave your clothing, don a toga and enter the palaestra or gymnasium for some exercising. From there you would enter the tepidarium, or warm bath room, where you would be scrubbed clean before entering the caldarium, or hot bath room (sort of like a sauna). You would then have another attendant massage you with oils. After your massage, it’s time to cool down in the frigidarium and then off you’d go to socialize around the swimming pool. This world-class museum also houses a collection of archeological finds that just boggle the mind. Included in this exhibition is the recent discovery of over 17,000 Roman coins dating back to the first century. After the Romans left in the 5th century, the city was claimed by the Saxons and then by the Normans, which left the city in ruins. A revitalization effort was begun in the 1500s when people began to flock to these mineral springs in the hopes of curing whatever ailed them …. like leprosy! Oh my!! But the real recovery didn’t come until the late 1700s when Richard “Beau” Nash, an opportunist and inveterate gambler, made the city a hub for the fashionable elite. Nash brought with him wealthy investors who built the Grand Pump Room, the Circus and the Royal Crescent among others, and created an atmosphere of elegant social life. 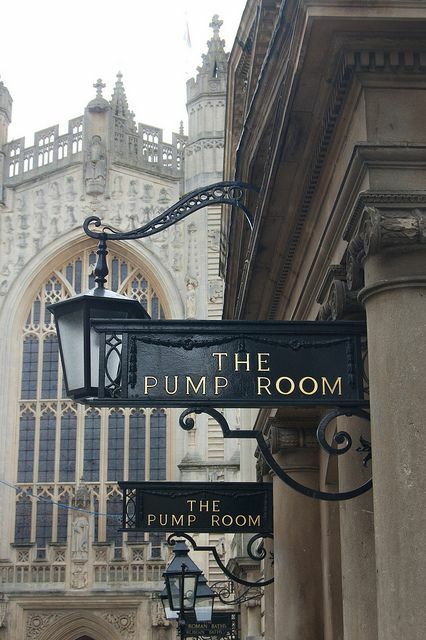 The original Georgian-style Grand Pump Room, built directly above the Roman Baths, was a “gathering” room for the wealthy … to see and be seen. As more and more people began flocking to this beautiful structure, it was deemed too small and was demolished. In 1796 a magnificent new building was constructed on the very site – eighty-five feet long, forty-six feet wide, and thirty-four feet high – which is the Pump Room you can visit today. Not only can you “take the waters” (which simply means you can drink a sample of the mineral water, for a fee), you can indulge in the most sumptuous of all classic Afternoon Teas while swaying to the music of the Pump Room Trio. Divine! 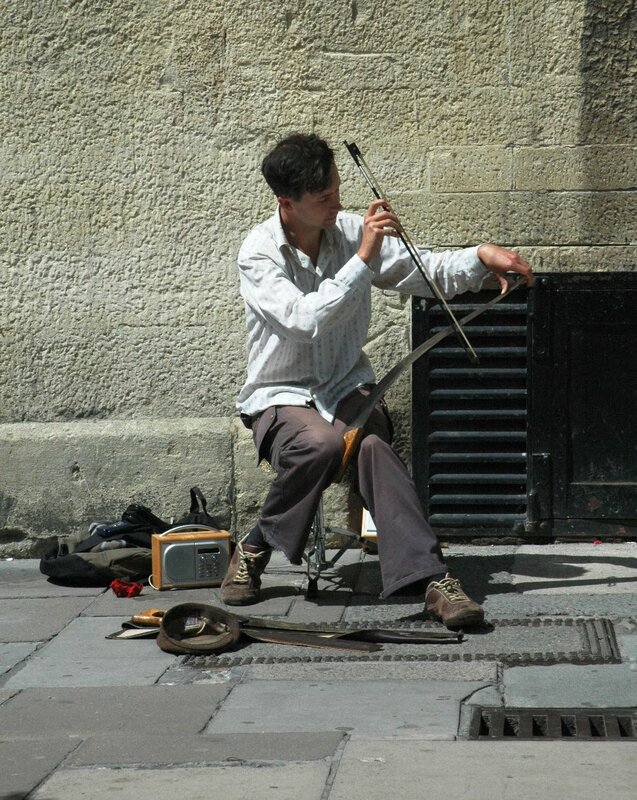 Completely revitalized the city attracted musicians, writers, artists and royalty. People like Charles Dickens, Thomas Gainsborough, Franz Liszt and Jane Austen. Actually it was Jane’s parents who moved their family to Bath in 1801. Jane was a young, talented novelist who used Bath as the setting for three of her six novels. Who hasn’t read (or at least seen the movies) Pride and Prejudice and Sense and Sensibility. More successful after her death than during her lifetime, the enormous popularity of Jane’s novels has led to multiple adaptations for movie and television screens. Sir Laurence Olivier starred as Mr. Darcy in the first version of Pride and Prejudice in 1940. The most recent film’s impressive cast included Keira Knightley, Donald Sutherland and Dame Judi Dench. For fans of Jane Austen, a visit to the Jane Austen Centre is a MUST. We were greeted by Mr. Darby himself upon entering the Centre! From the classic Georgian town house, to dressing up in any of the Regency costumes, including top hats, bonnets and fans, and then of course, enjoying a pot of tea with a savoury or two in the Tea Room on the second floor, you will catapult yourself back in time – just as it was in her novels. This memorable treat should not be missed. The city is resplendent in nature with sprawling open parks and meticulously-groomed gardens. 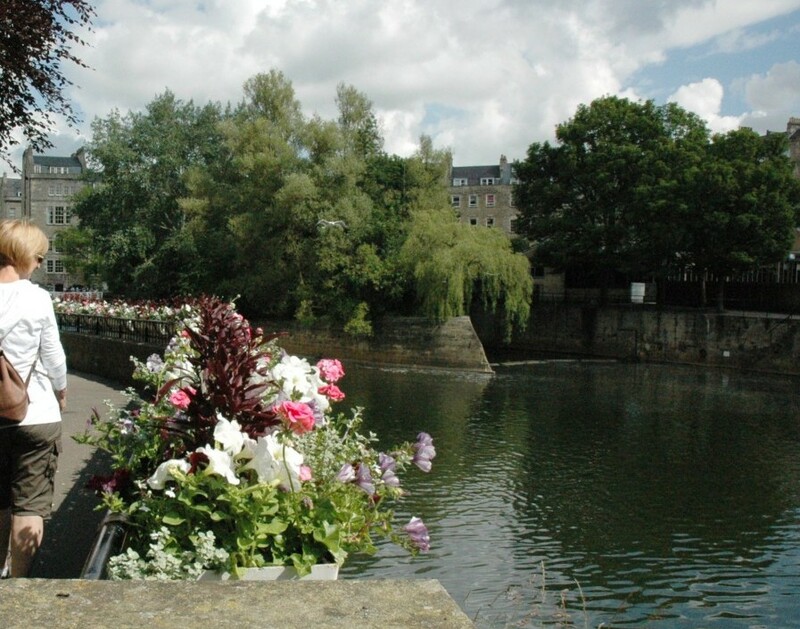 Crossing over the River Avon, Bath’s Pulteney Bridge is one of the world’s most beautiful bridges in the world. Just like the Ponte Vecchio in Florence, not only is it magnificent in its neoclassical architecture, it has shops built right into it … a perfect place to indulge in a little souvenir shopping. After picking up that memorable bauble, enjoy a relaxing cruise along this peaceful river. A visit to the Bath Abbey has to be on your list of places to visit. This imposing Gothic structure was built in 1499 on the site of two previous Abbeys, both of which had been destroyed in battles. This is actually one of the last medieval cathedrals to be built in England, and one of the most unique. Of course, you can marvel at the resplendent architecture and enjoy the relaxing atmosphere, but for a real treat take the tour up to the Bell Tower. Although there are areas where you can stop and rest, this memorable trek is not for the faint-of-heart or vertigo-afflicted. The steep 212 steps will take you behind the clock face, stand on top of the vaulted ceiling and visit the bell chamber room. Bring your camera, because the views are simply amazing. Where do you go after visiting the Abbey? Well, Sally Lunn’s, of course!! If you aren’t familiar with Sally Lunn, Sally was a young refugee coming from France in 1680. Finding work was almost impossible, but Sally (originally Solange Luyon) did have one skill, she knew how to make rich, French brioche rolls. A small bakery on Lilliput Alley (the oldest house in Bath) hired her to make these buns and sell them on the street corner. The buns became so popular, customers would visit the bakery to buy them fresh from the oven. The bakery, now known as the Sally Lunn House, is part tea room and part museum. Although it is said to be built in 1482 the excavations on display in the north cellar show that the house actually existed during the Roman occupation. Because it is conveniently located close to the Roman Baths, it is believed this site could have been an inn for Roman travelers. Again, put this bakery/tea room/museum on your MUST visit list. 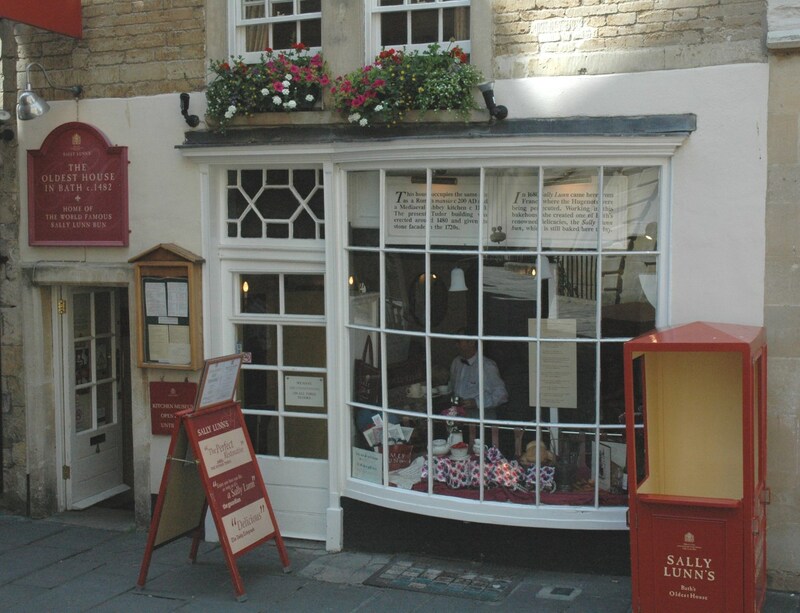 It is a unique and wonderful place to enjoy one of Sally Lunn’s rich buttery buns and a hearty cuppa. There is so much to see and do in this World Heritage City. I’ve just touched on a few. From the Roman Baths to the Jane Austen Centre, the Bath Abbey and Sally Lunn’s Tea Room to name just a few, Bath has to be one of my most favorite cities in England. I can’t wait to come back!